Born on September 22, 1920, Ernest Owen “E.O.” Harris grew up on a farm in the small town of Havensville, Kansas. His parents, Isla (née Eddy) and John, Sr., had four children: John, Jr., Genevieve, E.O., and Warren G., all of whom attended Havensville High School and Kansas State University. While Harris was young, his father, a grain farmer, also attended Kansas State to become a veterinarian, eventually becoming the State Veterinarian of Kansas. Not only did all four children graduate college, but all except Harris (who went directly to paratrooper training) continued their education to master’s or Ph.D. levels. 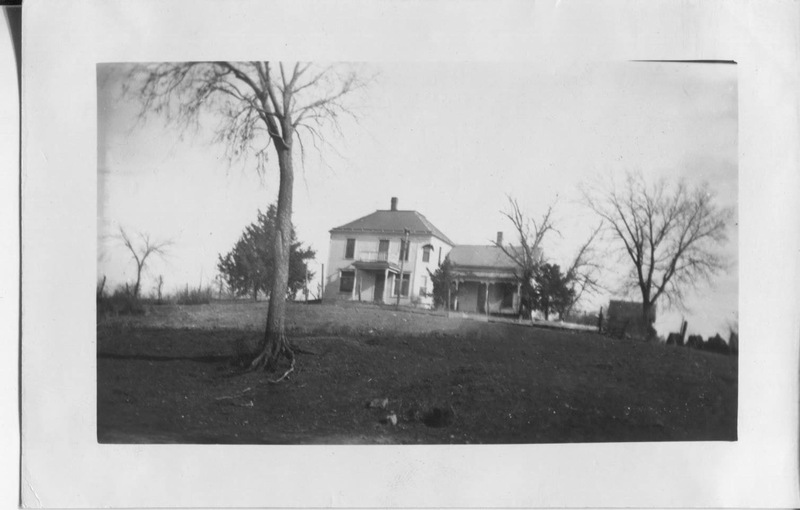 Isla and John, Sr. moved to Manhattan, Kansas so their children could live at home while attending Kansas State University. Harris was “a quiet, gentle soul” who “had it all together,” according to his cousin, Mary Eddy Stewart. He enjoyed life, but not to the point where one had to worry about him on a Saturday night. In high school, Harris played football and basketball. In the summers, he would also play baseball, often followed by family gatherings on the porch of the Harris farmhouse to make homemade ice cream. “The Americans who fought here that morning knew word of the invasion was spreading through the darkness back home. They fought — or felt in their hearts, though they couldn't know in fact, that in Georgia they were filling the churches at 4 a.m., in Kansas they were kneeling on their porches and praying, and in Philadelphia they were ringing the Liberty Bell.” — Ronald Reagan, speaking in Normandy on the 40th Anniversary of D-Day. Around 215,000 Kansans were “in uniform” during World War II. Kansas housed airfields and landing strips for training young pilots and saw booms in agricultural production, manufacturing (especially aircraft manufacturing), increased commodity prices, and improved incomes. In addition, aircraft manufacturing plants, like the one in Wichita, Kansas, employed many women and created a new social paradigm in the U.S. According to historian, Susan M. Hartmann, the female labor force in the U.S. grew by 6.5 million during the course of the war. In fact, it was during this time that Harris’s sister Genevieve gave up her job teaching home economics in Clyde, Kansas to work in a defense plant in Kansas City. Kansas became a major air traffic capital during the war. According to the Kansas Aviation Museum, “In 1944, a take-off or landing occurred every 90 seconds” at the Wichita Municipal Airport. This boom also created an industry of “thousands of local Rosie the Riveters,” according to Keith Myers of the Kansas City Star. Kansas was also home to many naval air stations as well as Camp Concordia, which housed more than 4,000 German POWs. By the end of the war, more than 3,500 Kansas families had received Western Union telegrams for boys who lost their lives fighting for their country. 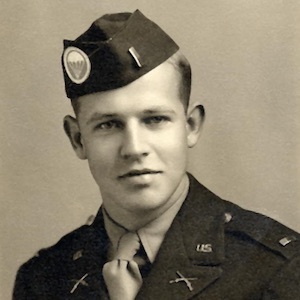 In January 1942, after graduating from Kansas State University, Harris attended parachute training at Fort Benning, Georgia, becoming the first in his family to join the war. 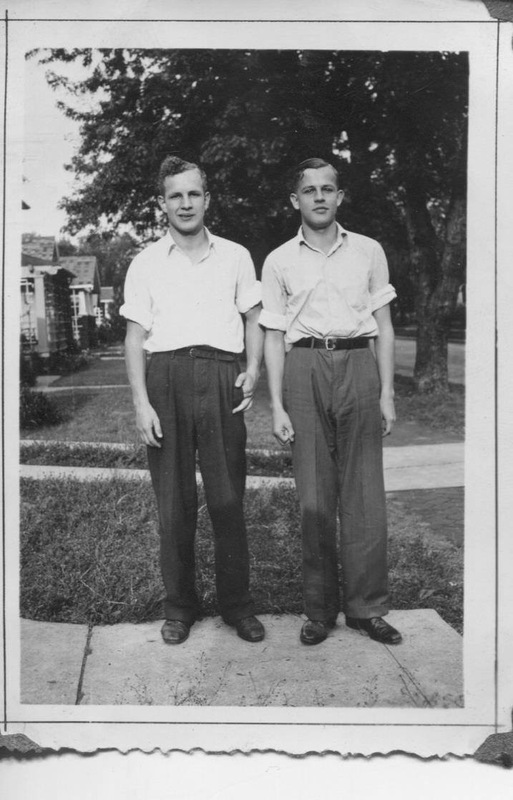 His volunteering for, and acceptance into, paratrooper school (one of the most selective programs in the military) was especially impressive to his family, among whom he was already “very much admired,” according his cousin, Bill Eddy. In August 1943, his unit transferred to England, where the 101st Airborne Division (known as the Screaming Eagles) participated in preparatory exercises for the invasion of Nazi-occupied Europe. Harris, now a First Lieutenant, joined Headquarters Company, 3rd Battalion, 502nd Parachute Infantry Regiment. In the early hours of June 6, approximately 6,600 paratroopers of the 101stAirborne Division dropped from 432 C-47s west of Utah Beach. Their mission included the capture of causeway bridges between Saint Martin-de-Varreville and Pouppeville, softening German defenses between National Road 13 and the shore, and aiding in the capture of Carentan to link the Omaha and Utah beachheads. At roughly 10 p.m. on June 5, the paratroopers left England. When the pathfinder planes and C-47 aircraft entered Norman airspace, they encountered heavy cloud cover as well as intense enemy fire and flak. Formations broke apart, and the drops were scattered around the Cotentin Peninsula. The German High Command received so many reports of Allied troops in different locations that they could not fully assess the size of the invading force and were therefore slower to respond. However, around 60 percent of the equipment that was dropped was lost, many paratroopers were killed before they even landed in France, and many more were captured or killed once they did. Shortly after landing, Harris, along with Major John P. Stopka and 13 other paratroopers, realized they had been dropped in the wrong place. The group made their way to Ravenoville, but encountered a stronghold of the enemy in the vicinity of Marmion. 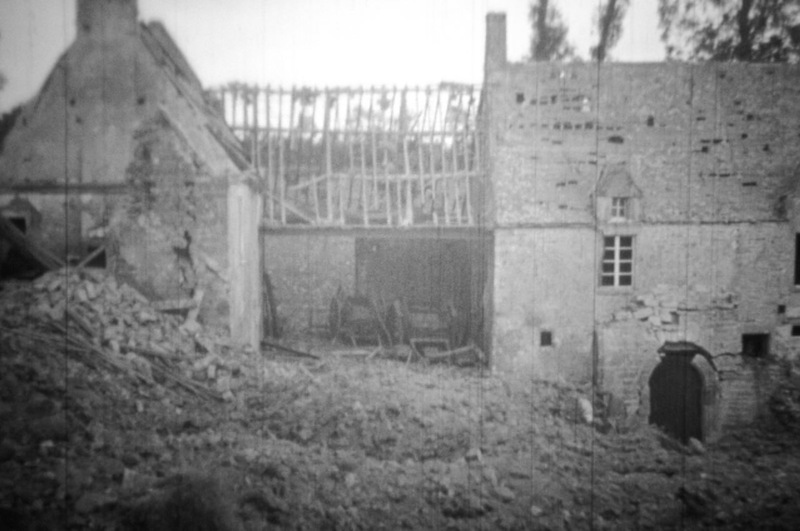 The captured farm contained vehicles, a first aid station, and an ammunition dump, and it was the headquarters of approximately 200 German soldiers. It was the primary enemy stronghold from Saint-Germain-de-Varreville to Ravenoville. Hours of “almost ceaseless combat, against great odds,” followed, according to the commanding officer of the 502nd Parachute Infantry Regiment. These men held the Marmion farm in this fashion for 30 hours. For his actions on June 6, 1944, Harris was awarded the Distinguished Service Cross. Lieutenant Colonel Cole ordered a smoke screen and led the assault himself. Known as “Cole’s Charge,” it was the first bayonet charge of World War II, and while it proved successful, 130 of Cole’s 265 men became casualties. First Lieutenant Harris lost his life that day. He died as he fought: in a courageous, audacious, and valiant demonstration of improvisation and adherence to duty. He was 23 years old. First Lieutenant Harris was no ordinary soldier, and that is because there is no ordinary soldier. For all the details of units and divisions and military strategy that went into making D-Day a success, a true picture of what happened here 73 years ago is incomplete without the understanding that a man from Kansas jumped out of a plane and into a country he had never seen before to put his life at great risk to free people he had never met. First Lieutenant Harris and his fellow soldiers flew over the Channel en route to their drop zone on the morning of D-Day. Stretched below them was the largest naval armada ever assembled in the history of the world. But wars are not won by armadas, ships, or guns, they are won by individuals. Individuals who leave behind families and friends to fight for something greater. Individuals with the courage to place service before self. Individuals whose stories are often not told. First Lieutenant Harris was one such individual, and I am proud to say he is silent no more. For his heroism in battle on June 6, 1944, First Lieutenant Harris was awarded the Distinguished Service Cross. First Lieutenant Harris, from the bottom of our hearts, we thank you. When students learn about history in school, we seldom view it as our history. Often, history becomes a distant repository of facts and figures and a source of stress in our academic lives. However, it is our history. The Normandy: Sacrifice for Freedom® Albert H. Small Student & Teacher Institute brings the history of World War II out of the books and out of the past and places it at one’s feet in the present. Omaha Beach ceases to be simply a term to be memorized, and, through intensive readings and discussions, becomes the site of a botched aerial bombardment, an invasion carefully timed with the tide, and the bloodiest sand on D-Day. However, even with that deep theoretical understanding, Omaha Beach remains a point on a map and the sand merely a reference. It is only on the day when the students stand on the beach and feel the sand through their fingers — when they watch the waves lap against the shore and the tide roll in at an unimaginable rate — it is only on that day that the history feels truly alive. While we visited many breathtaking and meaningful sites while in Normandy, I mention the beach on purpose. Each time I stood on the Norman sand, whether at Utah or Omaha, I tried with every fiber of my being to place myself in the shoes of a soldier, German or American, who was there during the invasion of Normandy. I strained to picture the formidable Allied armada rolling over the horizon before me. I tried to imagine Mullberries slicing up the ocean into artificial harbors and Higgins Boats run aground in all directions. I tried to visualize obstruction beams littering the sand and to hear the blood-curdling sounds of war fill the smoky air. I tried to imagine the bodies — bodies of young American men not much older than myself — covering the ground, their blood mixing with the water and the sand. However, try as I did, I was not able to do so. The water was too peaceful, the horizon too empty, the beach too clean, the air too quiet, to truly place myself in the shoes of a soldier. It took some time and some introspection, but I realized that I was never going to feel what those soldiers felt or see what they saw. However, that fact, both a limitation and a blessing, did not lessen the value of visiting those beaches. Rather, it enhanced it. I realized that those men fought for precisely that reason. They fought so that those beaches could one day be clean and that horizon one day empty — so that the air could one day be quiet and the water peaceful — so that a war like the one before them would be quite literally unimaginable to a student in the future. In that way, this project more than accomplished its goal; it utterly transformed the way I think about history, war, and sacrifice. It helped students like me, who have been lucky enough to have never experienced a war like the one we studied, understand both the true magnitude of the sacrifice made by those men and the asymptotic nature of fully understanding that very sacrifice. Looking out over the Normandy American Cemetery for the first time, I knew that somewhere among the white crosses and stars lay a man named E.O. Harris who I had been privileged to meet over the preceding months. However, I was struck first by the scale. Even though these service members made up only about 9,000 of the 400,000 American lives lost in World War II, I could not see where the rows of white came to an end. This visual simply confirmed what I had come to believe over the course of the project: that while no one person, no matter how much they may try, can truly fathom the sacrifices made by those who risked their lives to protect our freedom, no pursuit is more noble or more important for the future of humankind. The Normandy: Sacrifice for Freedom® Albert H. Small Student & Teacher Institute has given me many gifts, but chief among them is the insatiable urge to pursue that goal. Rubbing sand into First Lieutenant E.O. Harris’s name and delivering his eulogy was one of the most meaningful and memorable experiences of my life. When I returned to his grave later that day, a curious tourist inquired about the sand in the name. She asked me about a man I have never met but whom I know quite well. She asked me about E.O., and I was able to tell his story. It will be an honor and a privilege to continue to do so for the rest of my life. "Distinguished Service Cross." J. A. Ulio to Mr. John Harris. March 1, 1945. Kansas State University, Manhattan, Kansas. Eddy, Bill. Telephone interview with Jay Mehta. June 3, 2017. Ernest O. Harris, Individual Deceased Personnel File, Department of the Army. Flowers, Sheldon. Telephone interview with Jay Mehta. August 1, 2017. Harris Family Photographs. 1922-1942. Courtesy of Molly James. Harris Family Photographs. Courtesy of R. Lee Harris. E. O. Harris’ Distinguished Service Cross, Purple Heart, and Telegram from J.A. Ulio to John Harris. Kansas State University ROTC, Manhattan, KS. Kansas. Pottawatomie County. 1910 U.S. Census. Digital Images. http://ancestry.com. Kansas. Pottawatomie County. 1925 State Census. Digital Images. http://ancestry.com. Kansas. Pottawatomie County. 1930 U.S. Census. Digital Images. http://ancestry.com. Kansas. Riley County. 1940 U.S. Census. Digital Images. http://ancestry.com. Knouft, Floye. Telephone interview with Jay Mehta. August 1, 2017. Photograph of John Jr., Genevieve, and First Lieutenant Harris with Cousins. 1922. Havensville Historical Society, Havensville. Stewart, Mary Eddy. From Hoe to Harvest, The Life and Times of Galen Coates Eddy. Self-published, 1996. Stewart, Mary. Telephone interview with Jay Mehta. June 1, 2017. Records of the Adjutant General’s Office, 1917-, World War II Operations Reports, 1941-48, Record Group 407 (Box 11750); National Archives at College Park, College Park, MD. Records of United States Army Commands, 1942-; Records of European Theater of Operations, U.S. Army, Record Group 338 (Box 13); National Archives at College Park, College Park, MD. Bando, Mark. 101st Airborne: The Screaming Eagles in World War II. St. Paul, MN: Zenith Press, 2007. Buck’s Grove United Methodist Church. Buck’s Grove, 1879 to 1979: 100 Years of Service. 1979. Centennial Committee of Havensville. Our Heritage: Havensville, 1878-1978. 1978. Cowsert, Derek. "KC Women Who Did Their Part for World War II Recall Their Days as a Rosie the Riveter." Kansas City Star, January 17, 2015. Accessed March 3, 2017. http://www.kansascity.com/living/star-magazine/article6511668.html. 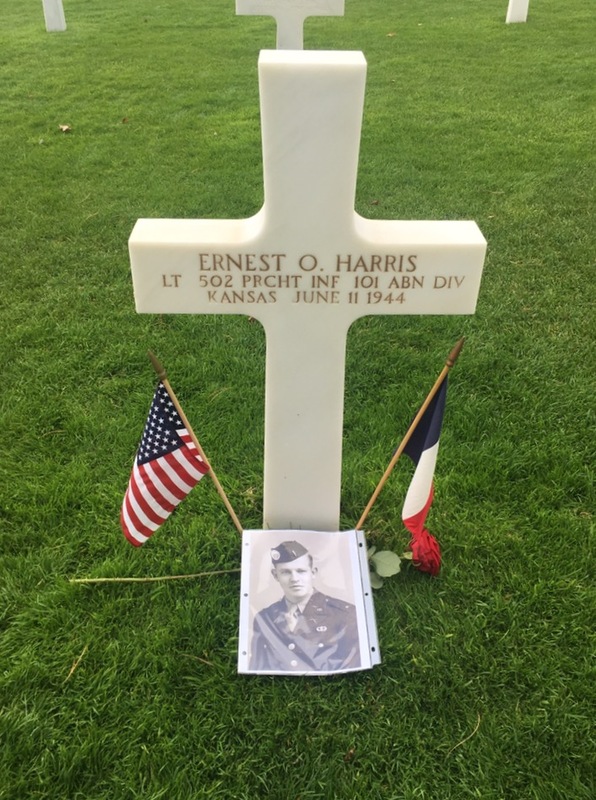 “Ernest O. Harris.” American Battle Monuments Commission. Accessed January 8, 2017. https://www.abmc.gov/node/409431#.WX_u8saZNXQ. Hancock, Peter. "Kansas Housed Thousands of POWs during World War II; Town Celebrates History as Guantanamo Concerns Grow." Lawrence Journal-World. Last modified September 05, 2015. Accessed March 3, 2017. http://www2.ljworld.com/news/2015/sep/06/kansas-housed-thousands-pows-wwii/ . Harris, R. Lee. Personal interview with Jay Mehta. March 31, 2017. "History of the Building." Kansas Aviation Museum. September 02, 2015. Accessed August 17, 2017. http://kansasaviationmuseum.org/about/history-of-the-building/. “The Homefront.” The Great Plains During World War II. Last modified 2008. Accessed March 4, 2017. http://plainshumanities.unl.edu/homefront/agriculture.html. James, Molly. Email interview with Sam Knopik. April 9, 2017. James Molly. Telephone interview with Jay Mehta. June 1, 2017. Pinick, Merrie. Personal interview with Jay Mehta. June 1, 2017. "Post-World War II." History of the Kansas Geological Survey. Last modified February 2003. Accessed March 2, 2017. http://www.kgs.ku.edu/Publications/Bulletins/227/11_post.html. Ruppenthal, Roland G. "The Airborne Assault." In Utah Beach to Cherbourg (6 June-27 June 1944), 14-23. Washington, D.C.: U.S. Army Center of Military History: 1990. Accessed March 29, 2017. http://www.history.army.mil/books/wwii/utah/utah.htm. Reagan, Ronald. Public Papers of the Presidents of the United States: Ronald Reagan, 1984, Book 1. Washington, D.C.: US Gov. Print. Off., 1984. Williams, L. C. "Farm Labor and Agricultural Production." The Great Plains During World War II. April 14, 1943. Accessed August 17, 2017. http://plainshumanities.unl.edu/homefront/homefront.docs.0007.